Christmas Day, yay! I can do what I want, eat and drink what I like and lounge around - at least once I've done my customary Park run and a few miles of the Festive 500 challenge! So, given it was going to be a funpacked day I made an early start. 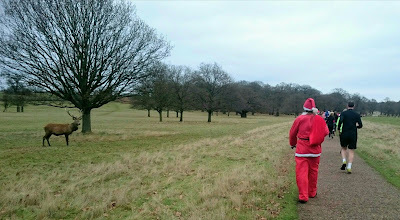 Midnight mass, a few hours' sleep and then 14-mile bike ride to Richmond Park for the Park run. I had never done the Park run there before, but chose this venue for Christmas as it's my favourite London park, and as it was going to be my 50th Park run I wanted to make an occasion of my run. Riding through London on Christmas day at 8am is a dream. If only it was like this all the time. I was able to take the main roads without any problem and not think about taking a quieter alternative or a traffic-free route. Streatham High Road, Wandsworth one-way system, the South Circular were such a breeze I thought I'd died and gone to heaven! The Park run was fun and festive, with the route being a loop set between Richmond Gate and Sheen Gate. They weren't the easiest 5kms, but they were definitely easier than cross-country races I've done in Richmond Park. Santa ditches his reindeer to join the Park run! Santa Claus came on the run as well, but I don't know what he was playing at. No sledge, and all the deer looking on forlornly wondering why he was running away from them! Alistair, the run director on the day was impressed that I had ridden over from Crystal Palace. That's a long way, he said. I didn't want to blow him out of the water and say I would be doing more riding around London after the run! 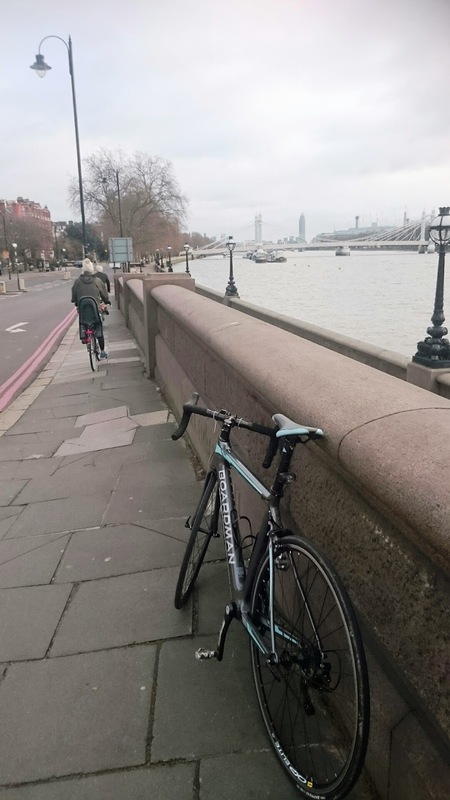 Next up was my route into London via Putney Bridge, Fulham, Chelsea, Knightsbridge and into Hyde Park. Traffic did begin to get a little busier, as the Sloane rangers who brought out their Chelsea tractors also wanted to take advantage of these relatively quiet roads. As for the parks, Christmas seemed like any other day. Loads of people were out in all of them - Hyde Park, St James's Park, Green Park and the Mall - walking, cycling on Boris Bikes, or scootering. In the sunshine there was a real feelgood factor, and London looked lovely - just like a set in a Christmas film. To jazz up my ride on this day, and for probably the only day of the year, I rode with my headphones on and sans helmet along the cycle superhighway from Embankment to Tower Bridge. On a day like this I couldn't not have a bit of Troika or Walking in the Air serenading me on my ride along the River Thames! Then after Tower Bridge, I came back down to earth with a bang! The pretty buildings, the Royal Parks, the family walks were all gone, and replaced with the drudge and dreariness of Bermondsey and Deptford. And, worst of all I was welcomed by a ravaging head wind, which blew even stronger after Lewisham. There was nothing to look at, apart from the tarmac as I pedalled madly, going nowhere fast! I guess you can't have it all. Eventually, I returned home and heaved a big sigh of relief while enjoying a well-earned glass of wine. I really appreciated my turkey roast, chocolates and mince pies.